Rackmount controller tackles competition with temperature measurement feature at fraction of prevailing cost. Expanding its portfolio of high-precision, thin film measurement and control devices, Colnatec recently announced the debut of a touchscreen-based controller that unites the precision and dependability of its Eon™ series of PC-based monitors and controllers with the modular efficiency of rackmount instrumentation. 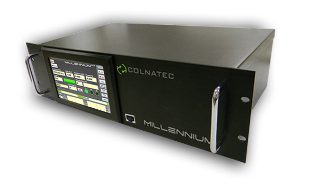 As with the Eon™ and Eon-LT™, the Millennium™ controller provides a simple yet comprehensive solution for users requiring a thin film controller that integrates neatly into a rackmounted system. The "Achilles heel" of thin film deposition process monitoring and control is the quartz crystal microbalance (QCM). Since its advent in the 1960's, QCM's have been an integral part of most commercial thin film coating systems. Unfortunately, the limitations of QCM's for processes such as optical coating, ion beam sputtering, MBE and CVD have not been adequately addressed. A new class of QCM sensor, designed for elevated temperatures, high stress dielectrics and extremely thin coatings is now available. This new sensor embodies an advanced crystallographic cut, "smart" sensor housings with integrated heaters, and novel crystal materials to extend the range of thin film monitoring to up to 250°C. June 1-6, 2014. The 13th International Conference on Muon Spin Rotation, Relaxation and Resonance (μSR2014) is to be held in Grindelwald, Switzerland, from Sunday, June 1st to Friday, June 6th, 2014. It is organized by the Paul Scherrer Institut (PSI), the University of Zurich and the University of Fribourg. The conference provides a forum to researchers from around the world with interests in the applications of μSR to study a wide range of topics including condensed matter physics, materials and molecular sciences, chemistry and biology. The Conference will consist of invited and contributed talks as well as poster sessions.